Because there is a lot more to parties than tables and chairs. Vintage Mahogany buffet. Two drawers and two side cabinets. Beautiful scroll work. 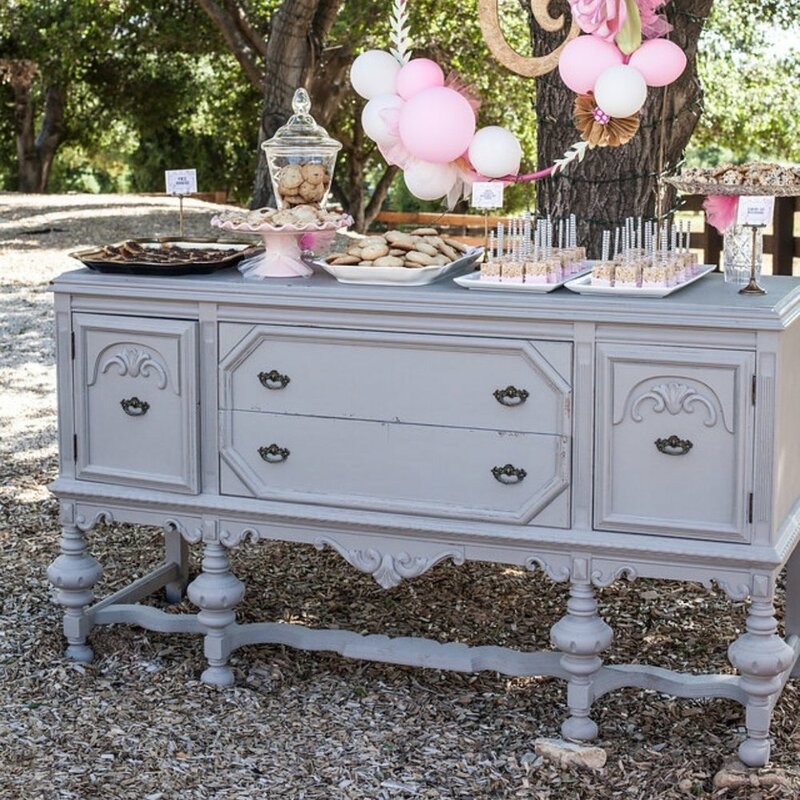 Perfect as a dessert bar or sign in area. Vintage china cabinet chalk painted in sweet pea green. Three shelves with a glass door that opens. Five drawers and two cabinets. 69” tall x 40” wide x 13” deep. Vintage tall dresser with 6 drawers. Scrolled, beveled mirror with details at the base.. 68" tall x 34" long x 20" wide. Without the mirror 47" tall. Narrow white wicker high boy dresser. Six drawers that open. 49” tall x 18.5” wide x 13” deep. Use you imagination with this darling Boho piece. 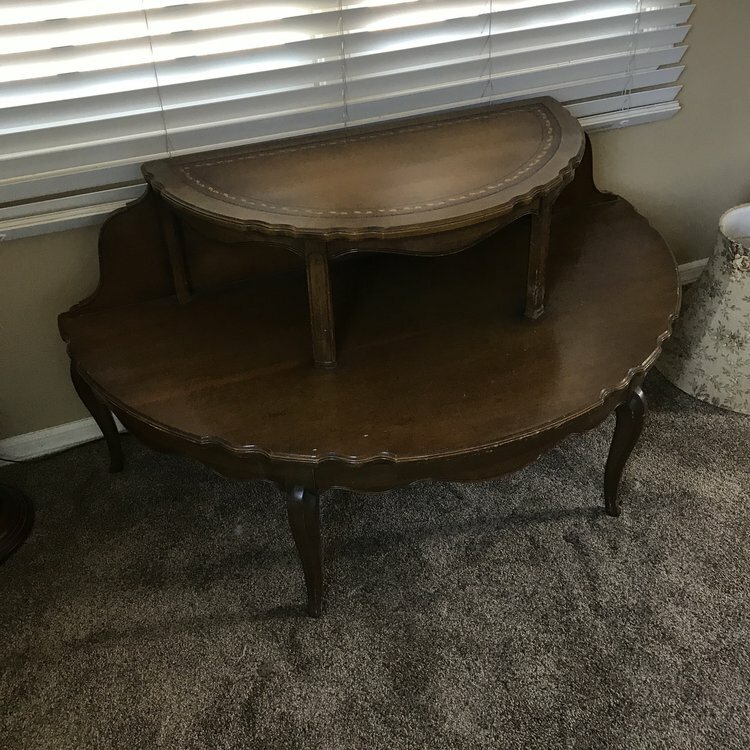 Two tiered, half round, side table. Leather top with gold leaf embellishment. Bottom shelf 48" x 24". Top shelf 32" x 16.5". 25" high. 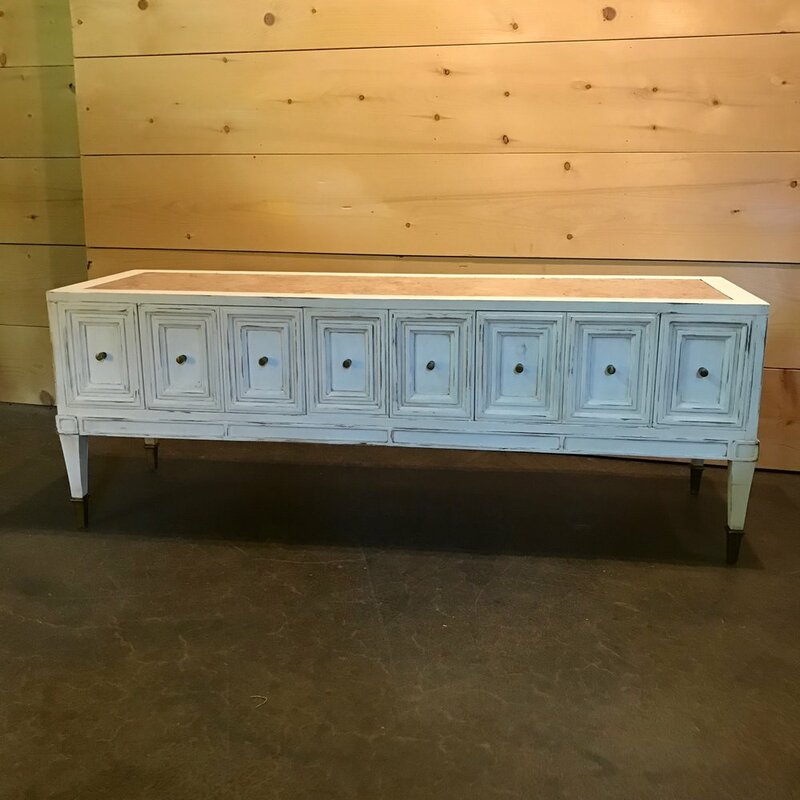 French Linen antique buffet with two doors and two drawers. Hot pink interior. Scalloped bottom with four ornate legs. 70" x 22" rectangle. 37.5" tall. Wooden, white crackle, six drawer vanity with mirror. Comes with a vanity stool. Perfect for sign in table, remembrance table, cake table or favor table. Antique curved front dresser with hand carved mirror. Circa 1908. 73" tall with mirror x 20.5" wide x 44" long. Bottom only 32.5" tall. Darling distressed white with flecks of gold leafing showing through miniature buffet. Two doors that open to a useable inside shelve. 36.5” wide x 18” deep x 29” high. Three tiered, circa 1940, piecrust table with metal claw feet. Bottom tier 22" round, middle tier 16" round, top tier 12" round. Vintage black buffet or desk with five drawers and spindle legs on casters. 54” wide x 8.5” depth x 32” high. Great for candy bar, desserts, sign in table or bar. Vintage oak four drawer dresser with ornate carved beveled mirror. Great for cakes, sweets, sign in, table assignment. 76" tall x 42" long x 18" wide. Dresser top 33" high. 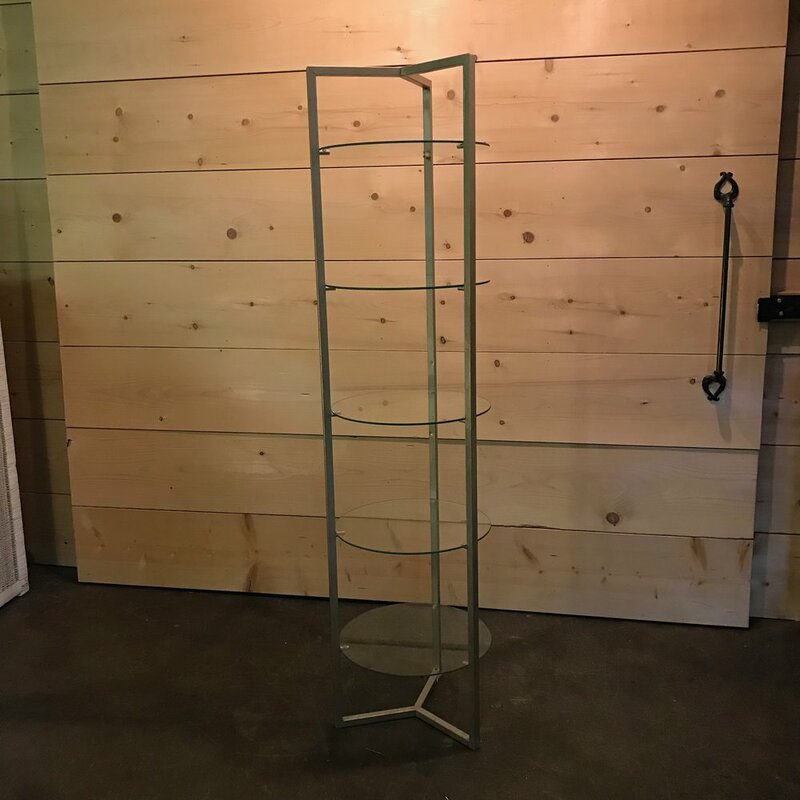 Brass etagere with five round glass shelves that are 17” in diameter. The overall height of the shelving is 64” tall. Perfect for displaying all kinds of delicacies. A true French gold leafed side dresser. Two drawers. Tole painted. Petite but ready to party. 30” tall x 25.5” long x 15” wide. 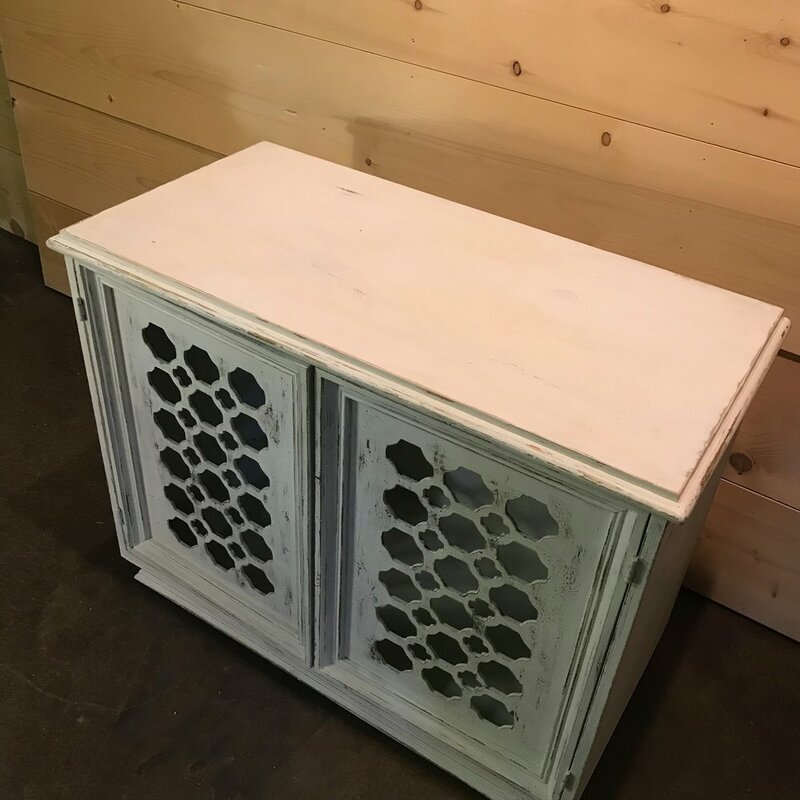 Petite Shabby Chic, three cupboard, buffet. Half hexagon shape. Perfect for use as a sign in table. 29" tall x 38" long x 12" wide at the widest point. A true Mid-century Modern portable mini bar on wheels. Chrome lid that opens for mixing drinks. Two doors open for ice bucket, bottles, glasses 27" long x 17" wide. 33.5" high. Three tiered ruffled edge round pie table. Perfect for desserts.